Samsung Galaxy Note II is a high-end phone launched in 2012, including a great Quad-Core processor ticking at 1.6 GHz, a 5.5 inches multi touch screen, and two cameras, an 8 mega-pixels back-facing camera and a 1.9 mega-pixels front side camera. Is that all? No, it's only the starting point of a detailed review. Samsung decided to design the Note II using a Samsung Exynos 4 (4412) system chip, packing a high speed 1.6 GHz Quad-Core CPU with a big 2 GB of RAM. Collaborating with graphic rendering, the Note II also counts with a 266 MHz ARM Mali-400 MP4 GPU. A great point of this device is its large 32 GB internal memory and an external SD slot, which allows you to store hundreds of applications without worrying about running out of space. Samsung made an excellent job making this cellphone weight just 6.44 oz. Whereas this cellphone is only 5.94 inches long and 3.17" wide, it manages to pack a 5.5 inches display. This cellphone is incredibly thin and stilized, with a thickness of just 0.37 inches. 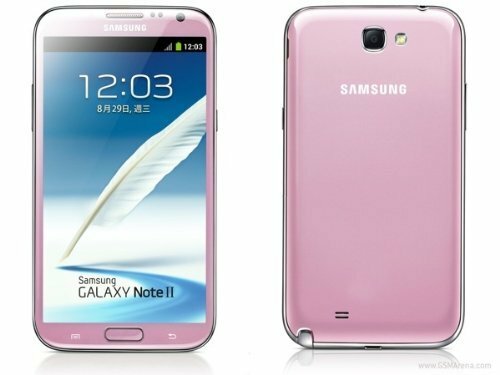 Samsung made this phoneavailable only in 3 different color options, pink, blue and white. The Note II is equipped with two cameras, an 8 megapixels back facing camera and a 1.9 mega-pixels front facing camera. It also films 1920x1080 Full HD videos at 30 fps. To complete the camera, it also counts with a few useful features: flash, auto-focus, smile detection shooting and fast burst mode. This phone is equipped with a nice 5.5 inches display with a 1280 x 720 (HD) resolution, which makes it hard to distinguish the pixels forming the display. Its display uses Super AMOLED capacitive technology, and can detect multi touch gestures. This phone offers WiFi connectivity (and it can provide it to other devices as a mobile hotspot), 4G (LTE) fast connection type and also HSPA+ internet connection, that is a slower 4G network or fast 3G internet connection, supported by HSDPA, HSUPA, UMTS and EDGE technologies. This cellphone works with a SIM card to connect to GSM networks. This phone features a 3100 mAh great Li-Ion replaceable battery, enough to provide the Samsung Galaxy Note II with an amazing battery duration. This phone has an estimated talk time of 35 hs and a stand by time of 980 hours. The Samsung Galaxy Note II also includes some interesting features like Bluetooth (4.0), GPS Localization and NFC (to trigger actions, transfer data or make payments by holding your cellphone close to another NFC device or tag), and multiple sensors like Light Sensor, Proximity Sensor, Accelerometer, Gyroscope, Barometer and Compass. This cellphone costs only $ 200, which is an incredibly low price for a cellphone as great as this. This cellphone is definitely a great choice for you no matter if you want a social cellphone, want a device for work, want this cellphone for playing games or are an amateur photographer.